Jordan has so much to offer! There is historical sites, such as Petra, the many Roman Amphitheatres, Jericho, Al Maghtas (baptism Site, Bethany – Jordan River) and everything in between. There is Nature at its most beautiful, such as the deserts of the south, which house the magical mountains of Wadi Rum very closely located to Aqaba, the city by the beautiful and rich Red Sea. There are the water springs of Ma’ine, the greenery of the north and all that you can think of in terms of natural beauty. Jordan is a must visit, if you haven’t already! It is beautiful, with lots to offer. 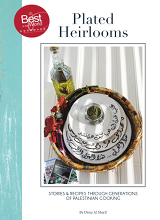 is inspired and based on the Saudi Arabian Bedouin dish “Thereed”. Thereed is essentially a dish made out of meat, broth and bread. The whole area was inhabited by Bedouins and as they happen to be living in the desert, they kept on moving in search for water and shelter from the harsh weather conditions in the different seasons. These relocation have carried with them the Bedouin’s food and traditions to the new areas. 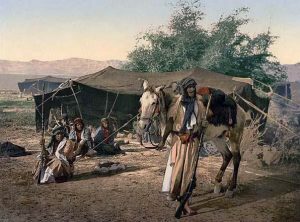 The early Jordanian Bedouins ate Thereed as their main food, of course as being a desert the food was limited to that environment’s produce. As Jordan started becoming an agricultural country, and being influenced by the peasants and the cultures of the migrating neighbours and later also the dislocated neighbours, the country’s produce started growing in number and kind. Consequently, the Jordanian Bedouins started introducing new produce into their food, such as rice, wheat, Bulgur as well as yogurt. Which eventually went into their main food preparation and evolved the originally Thereed into what is now known as Mansaf. The making of Mansaf, starts well before the actual cooking. Making the Jameed (fermented yoghurt, from which Mansaf is made) is the first step. Jameed balls, are bought from local stores, and some speciality stores. In Jordan they are always bought from the source: the Bedouins making it. Nowadays, there is a modern version of Jameed that comes in carton containers, already liquified, but they are nowhere near the goodness of the original dried Jameed balls. If you live in the UAE, you can buy my gorgeous, artisanal “DS Jameed Balls” here. These are small batch, made by a Bedouin artisan that I have sourced myself and are extremely superior quality Jameed. Here is a quick run through how Jameed is made. Jameed is made out of milk. The milk can vary from maker to another and sometimes from area to another, and so does the quality. The best quality Jameed is made out of Goat’s Milk. The Karaki Jameed (Coming from Karak) is famous to be the best in Jordan. The Goat’s milk is put in a container to change from milk to yogurt. It is then placed in a sack (originally made from goats’ skin) and shaken to separate the milk solids from liquids. The remaining Soured Milk (liquids) is then heated to separate further. The whole separated mixture is then placed in a large cloth (kind of like a cheese cloth technique) to completely drain out all the remaining liquid. There will only remain the Jabjab, which is the hard solid part. This is then mixed with salt, and left for a further 24 hours in the cloth to dry. Then it is taken out of the cloth, and pressed together and shaped into balls, which are then left to sun-dry for 2-3 days. These Jameed balls will then be rock hard, and the name (literally meaning “solid”) is reflective of their dry solid state. These Jameed Balls can be stored for about a year, which is very convenient for desert life, as they had no access to refrigeration and other storage options. Then when ready to cook, the Jameed is rehydrated, by being broken up, soaked in water and rubbed to go back into liquid state. It is then added to meat and broth, creating a yoghurt-based sauce, the actual mansaf. Drawn mainly from Bedouin Traditions, Mansaf is usually offered by Jordanian hosts as a token of appreciation, respect and value. It is an expression of how valued you are to them as their guest. The meat used is generally indicative of the guest’s status to them. If it is made with Goat’s Meat that is reflective of the highest grades of respect and value, less is the lamb, and least is the chicken. The original Mansaf will have the cooked head of the goat, placed at its centre. This is usually offered to the most important or valued guest by the host as a symbol of respect and great hospitality. Traditionally, ready-to-eat Mansaf is placed in a large serving tray (Sider) as it is traditional for all to be served from one dish. Mansaf is traditionally eaten with the fingertips of the right hand, while the left hand is placed behind the back. The host will keep on drenching the rice with cooked Jameed (yogurt sauce) for his guests to enjoy a moistened bite. by doing so, the host is also ensuring best hospitality and celebrating the obviously valued guests. It is always good to know the traditions, to love and celebrate them, but in the end we cook, eat and serve food our way. This is exactly why we share recipes, exactly why I love reading and learning about the same foods from different sources. Each has their own touch, so don’t be afraid to have yours in the food you make. I love Mansaf… find my Mansaf Recipe on this link. Salaam and thank you for the recipe! I just have one question: Do I cook the rice with the broth? That part is a bit unclear to me, because you stated that we should use all 3 L. of the broth for 5 lbs. of lamb prior to adding the jameed. Or do I only mix the jameed/lebane with half the broth and use the remainder for the rice? In general for cooking the lamb in this recipe you will need 3 ltrs of broth. The broth volume should be 1/3 of the lamb volume. If the meat shrinks during cooking, you might have to reduce the level of liquid a little bit. As for cooking the rice, you will need 1.5 ltr for the amount of rice used in this recipe. If you have prior made broth, you ca use that, or if you want to use broth from this recipe, you will have to adjust the liquid quantities accordingly (just add more water). PS Don't confuse the overall water used to cook the lamb with the 3 ltrs used to finish up the mansaf. if you have made a total of 5 ltrs of broth, use 3 in the actual jameed sauce and 1.5 for the rice! Did you ever come up with any good (or bad) vegan recipes for mansaf? No I haven't actually. And specifically this dish I dont think it will ever be made vegan. The whole thing is reliant on goat's milk and meat broth and pieces! Maybe with another dish! Yes Mansaf is delicious, and one of those distinct flavours that you can only have as mansaf. It would be interesting to see how it can be done vegan!!! I am telling you that is a tough task!! In Mansaf mint is not used in the making of the sauce. 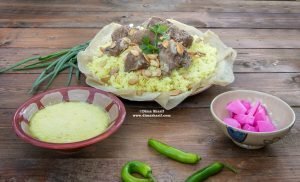 In fact the traditional Jordanian Mansaf is made using only Jameed without the addition of yogurt, which is why I named this recipe Dima's Mansaf recipe. I personally add the yogurt as I find it tastes better this way. As for the fritters (mshat) am still not sure what you are referring to?! are they fried then cooked in stew (yogurt based, or tomato based) or are you talking about the appetiser version with tahina? There is a phenomenal palestinian recipe of fried cauliflower cooked in yogurt sauce which we call makmooret zahra (I will be posting this recipe very soon as it is worth the glory, it is super delicious). We also have another recipe of stuffed zucchinis in meat and nuts which are then fried and afterwards cooked in minted yogurt sauce. Are these the ones you are talking about? Miriam, that is because that area has a specific cuisine called Laventine Cuisine (and all regions of it are very similar). Cuicine is usually determined by the geography, access to sea and produce. All the Levant is one of the same. But like with Mediterranean cuisine, despite the similarities, each region is known for something and each part does a recipe differently, regardless of the oneness of ingredients. A little change in a recipe changes the whole experience. so true, thank you so much..luv ur blog ..looking forward to trying out my kitchen skills..especially with the cooked laban!! was wondering have u heard of that zahra cooked in yougurt but also with tahineh in there or does the palestinain one just use yogurt? Yes I have, I will try and post a recipe for you ASAP..
Dima, I am making this with goat meat this weekend and I attempted to make my own goat milk yogurt. It was a little thin but I wanted to do it authintic. Should I use the goat yogurt and mix with the regular yogurt? The goat yogurt is very sour like you say the jameed should be. I am looking so forward to making this dish;) Thank you so much for all the detailed information. Wow! Making your own goat milk yogurt, that is fantastic! Yes you can mix both yogurts, infact using goat's yogurt makes it richer. Fabulous, informative post. Was doing research on Mansaf, so this article was really useful. Thanks as always Dima! You are always welcome Arva, am glad you found what you are looking for in my post 🙂 If you need more info about mansaf I would be more than happy to cook it for you to try and we can sit n talk about all you need to know. Does anybody know how and can provide detailed instructions or where exists detailed instructions on how to make Jameed? 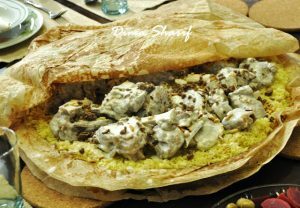 I have been looking and looking, since being told about Mansaf (I love lamb! ), but where I live here in Ontario, cannot find a source for Jameed. I can however, get goat's milk and am considering trying to make my own Jameed. It might be a fun experiment, but wish I could find detailed instructions on this.